"Red October" redirects here. For other uses, see Red October (disambiguation). This article is about the Soviet Revolution of 1917. For other uses, see October Revolution (disambiguation). The October Revolution (Russian: Октя́брьская револю́ция, tr. Oktjabrjskaja revoljucija; IPA: [ɐkˈtʲabrʲskəjə rʲɪvɐˈlʲutsɨjə]), officially known in the Soviet literature as the Great October Socialist Revolution (Russian: Вели́кая Октя́брьская социалисти́ческая револю́ция, tr. Velikaja Oktjabrjskaja socialističeskaja revoljucija), and commonly referred to as Red October, the October Uprising or the Bolshevik Revolution, was a seizure of state power instrumental in the larger Russian Revolution of 1917. It took place with an armed insurrection in Petrograd traditionally dated to 25 October 1917 (by the Julian or Old Style calendar, which corresponds to 7 November 1917 in the Gregorian or New Style calendar). The revolution was led by the Bolsheviks, who used their influence in the Petrograd Soviet to organize the armed forces. 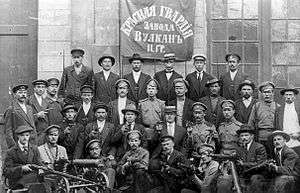 Bolshevik Red Guards forces under the Military Revolutionary Committee began the takeover of government buildings on 24 October 1917. The following day, the Winter Palace (the seat of the Provisional government located in Petrograd, then capital of Russia), was captured. The long-awaited Constituent Assembly elections were held on 12 November 1917. The Bolsheviks only won 175 seats in the 715 seat legislative body, coming in second behind the Socialist Revolutionary party, which won 370 seats. The Constituent Assembly was to first meet on 28 November 1917, but its convocation was delayed until 5 January 1918 by the Bolsheviks. On its first and only day in session, the body rejected Soviet decrees on peace and land, and was dissolved the next day by order of the Congress of Soviets. At first, the event was referred to as the October coup (Октябрьский переворот) or the Uprising of 25th, as seen in contemporary documents (for example, in the first editions of Lenin's complete works). In Russian, however, "переворот" has a similar meaning to "revolution" and also means "upheaval" or "overturn", so "coup" is not necessarily the correct translation. With time, the term October Revolution (Октябрьская революция) came into use. It is also known as the "November Revolution" having occurred in November according to the Gregorian Calendar. The Great October Socialist Revolution (Russian: Вели́кая Октя́брьская Социалисти́ческая Революция, Velikaya Oktyabr'skaya sotsialisticheskaya revolyutsiya) was the official name for the October Revolution in the Soviet Union after the 10th anniversary of the Revolution in 1927. The February Revolution had toppled Tsar Nicolas II of Russia, and replaced his government with the Russian Provisional Government. However, the provisional government was weak and riven by internal dissension. It continued to wage World War I, which became increasingly unpopular. A nationwide crisis developed in Russia, affecting social, economic, and political relations. Disorder in industry and transport had intensified, and difficulties in obtaining provisions had increased. Gross industrial production in 1917 had decreased by over 36% from what it had been in 1914. In the autumn, as much as 50% of all enterprises were closed down in the Urals, the Donbas, and other industrial centers, leading to mass unemployment. At the same time, the cost of living increased sharply. Real wages fell about 50% from what they had been in 1913. Russia's national debt in October 1917 had risen to 50 billion rubles. Of this, debts to foreign governments constituted more than 11 billion rubles. The country faced the threat of financial bankruptcy. In September and October 1917, there were mass strike actions by the Moscow and Petrograd workers, miners in Donbas, metalworkers in the Urals, oil workers in Baku, textile workers in the Central Industrial Region, and railroad workers on 44 railway lines. In these months alone, more than a million workers took part in strikes. Workers established control over production and distribution in many factories and plants in a social revolution. By October 1917, there had been over 4,000 peasant uprisings against landowners. When the Provisional Government sent punitive detachments, it only enraged the peasants. The garrisons in Petrograd, Moscow, and other cities, the Northern and Western fronts, and the sailors of the Baltic Fleet in September declared through their elected representative body Tsentrobalt that they did not recognize the authority of the Provisional Government and would not carry out any of its commands. In a diplomatic note of 1 May, the minister of foreign affairs, Pavel Milyukov, expressed the Provisional Government's desire to continue the war against the Central Powers "to a victorious conclusion", arousing broad indignation. On 1–4 May, about 100,000 workers and soldiers of Petrograd, and after them the workers and soldiers of other cities, led by the Bolsheviks, demonstrated under banners reading "Down with the war!" and "all power to the soviets!" The mass demonstrations resulted in a crisis for the Provisional Government. 1 July saw more demonstrations, as about 500,000 workers and soldiers in Petrograd demonstrated, again demanding "all power to the soviets", "down with the war", and "down with the ten capitalist ministers". The Provisional Government opened an offensive against the Central Powers on 1 July which soon collapsed. The news of the offensive and its collapse intensified the struggle of the workers and the soldiers. A new crisis in the Provisional Government began on 15 July. Another problem for the government centered on General Lavr Kornilov, who had been Commander-in-Chief since 18 July. In response to a Bolshevik appeal, Moscow’s working class began a protest strike of 400,000 workers. They were supported by strikes and protest rallies by workers in Kiev, Kharkov, Nizhny Novgorod, Ekaterinburg, and other cities. In what became known as the Kornilov affair, Kornilov directed an army under Aleksandr Krymov to march toward Petrograd to restore order to Russia, with Kerensky's agreement. Although the details remain sketchy, Kerensky appeared to become frightened by the possibility the army would stage a coup, and reversed the order. By contrast, historian Richard Pipes has argued that the episode was engineered by Kerensky. On 27 August, feeling betrayed by the government, Kornilov pushed on towards Petrograd. With few troops to spare on the front, Kerensky turned to the Petrograd Soviet for help. Bolsheviks, Mensheviks and Socialist Revolutionaries confronted the army and convinced them to stand down. The Bolsheviks' influence over railroad and telegraph workers also proved vital in stopping the movement of troops. Right-wingers felt betrayed, and the left wing was resurgent. On 23 October [O.S. 10 October] 1917, the Bolsheviks' Central Committee voted 10–2 for a resolution saying that "an armed uprising is inevitable, and that the time for it is fully ripe". The Bolsheviks created a revolutionary military committee within the Petrograd soviet, led by the soviet's president, Trotsky. The committee included armed workers, sailors and soldiers, and assured the support or neutrality of the capitol's garrison. The committee methodically planned to seize strategic locations through the city, almost without concealing their preparations: the Provisional Government's president Kerensky was himself aware of them, and some details, leaked by Kamenev and Zinoviev, were published in newspapers. On 7 November [O.S. 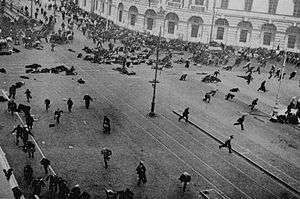 25 October] 1917, Bolsheviks led their forces in the uprising in Petrograd (modern day Saint Petersburg), then capital of Russia, against the Kerensky Provisional Government. The event coincided with the arrival of a flotilla of pro-Bolshevik marines, primarily five destroyers and their crew, into the St. Petersburg harbor. At Kronstadt, sailors also announced their allegiance to the Bolshevik insurrection. In the early morning, the military-revolutionary committee planned the last of the locations to be assaulted or seized from its heavily guarded and picketed center in Smolny palace. The Red Guards systematically captured major government facilities, key communication, installations and vantage points with little opposition. The Petrograd Garrison and most of the city's military units joined the insurrection against the Provisional Government. Kerensky and the provisional government were virtually helpless to offer significant resistance. Railways and rail stations had been controlled by Soviet workers and soldiers for days, making rail travel to and from Petrograd, for Provisional Government officials, impossible. The Provisional Government was also unable to locate any serviceable vehicles. On the morning of the insurrection, Kerensky desperately searched for a means of reaching military forces he hoped would be friendly to the Provisional government outside the city, and ultimately borrowed a Renault car from the American Embassy, which he drove from the Winter Palace alongside a Pierce Arrow. Kerensky was able to evade the pickets going up around the palace and drive to meet oncoming soldiers. As Kerensky left Petrograd, Lenin penned a proclamation "To the Citizens of Russia" stating that the Provisional Government had been overthrown by the Military Revolutionary Committee. The proclamation was sent via telegram all throughout Russia, even as the pro-Soviet soldiers were seizing important control centers throughout the city. One of Lenin's intentions was to present members of the Soviet congress, who would assemble that afternoon, with a fait accompli and therefore forestall further debate on the wisdom or legitimacy of taking power. The insurrection was mostly bloodless, with a final assault being launched against the Winter Palace, poorly defended by 3,000 cadets, officers, cossacks and female soldiers. The assault was delayed throughout the day, both because functioning artillery could not be found, and because the Bolsheviks feared violence when the insurrection had so far been peaceful. At 6:15 p.m., a large group of artillery cadets abandoned the palace, taking their artillery with them; at 8:00 p.m., 200 cossacks also left the palace and returned to their barracks. While the cabinet of the provisional government within the palace debated what action to take, the Bolsheviks issued an ultimatum to surrender. Workers and soldiers occupied the last of the telegraph stations, cutting off the cabinet's communications with loyal military forces outside the city. As the night progressed, crowds of insurgents surrounded the palace, and many infiltrated it. While soviet historians and officials tended to depict the event in heroic terms, the insurrection and even the seizure of the Winter Palace happened almost without resistance. 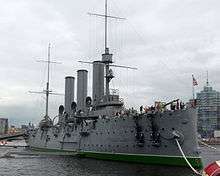 At 9:45 p.m, the cruiser Aurora fired a blank shot from the harbor. By 2:00 a.m on 8 November [O.S. 26 October] 1917 Bolshevik forces entered the palace, and after sporadic gunfire throughout the building, the cabinet of the provisional government surrendered. Later official accounts of the revolution from the Soviet Union would depict the events in October as being far more dramatic than they actually had been. (See firsthand account by British General Knox.) This was helped by the historical reenactment, entitled The Storming of the Winter Palace, which was staged in 1920. This reenactment, watched by 100,000 spectators, provided the model for official films made much later, which showed a huge storming of the Winter Palace and fierce fighting (See Sergei Eisenstein's October: Ten Days That Shook the World). In reality, the Bolshevik insurgents faced little opposition. The insurrection was timed and organized to hand state power to the Second All-Russian Congress of Soviets of Workers' and Soldiers' Deputies, which began on 25 October. After a single day of revolution, 18 people had been arrested and two killed. Soviet government archives show that parties of Bolshevik operatives sent from the Smolny by Lenin took over all critical centers of power in Petrograd in the early hours of the first night without a shot being fired. This was completed so efficiently that the takeover resembled the changing of the guard. The capture of the Winter Palace was more dramatic, with the Red Guards storming it at 2:10 a.m. on 8 November [O.S. 26 October] 1917. The Cossacks deserted when the Red Guard approached, and the Cadets and the 140 volunteers of the Women's Battalion surrendered rather than resist the 40,000 strong army. The Aurora was commandeered to then fire blanks at the palace in a symbolic act of rejection of the government. The effectively unoccupied Winter Palace fell not because of acts of courage or a military barrage, but because the back door was left open, allowing the Red Guard to enter. A Red Guard named Adamovich remembered gasping as he burst into the palace, as he had never before seen such luxury and splendour. A small group broke in, got lost in the cavernous interior, and accidentally ran into the remnants of Kerensky's provisional government in the imperial family's breakfast room. The illiterate revolutionaries then compelled those arrested to write up their own arrest papers. The Provisional Government was arrested and imprisoned in Peter and Paul Fortress after the ministers resigned to fate and surrendered without a fight, and officially overthrown. Some sources contend that as the leader of Tsentrobalt, Pavlo Dybenko played an enormous role in the revolt. It is said that the ten warships that entered the city with ten thousand Baltic fleet mariners was the force that actually took the power in Petrograd and put down the Provisional Government. The same mariners then dispersed by force the elected parliament of Russia, and used machine-gun fire against protesting demonstrators in Petrograd. About 100 demonstrators were killed, and several hundreds wounded. Dybenko in his memoirs mentioned this event as "several shots in the air". Later, during the first hours after the taking the Winter Palace, Dybenko personally entered the Ministry of Justice and destroyed there the documents about the financing of the Bolshevik party by Germany. These are disputed by various sources such as Louise Bryant, who claims that news outlets in the West at the time reported that the unfortunate loss of life occurred in Moscow, not Petrograd, and the number was much less than suggested above. As for the "several shots in the air", there is little evidence suggesting otherwise. The alleged action of Dybenko entering the Ministry of Justice to destroy documents as recalled by Savchenko can also be challenged. According to reports, Pavel Dybenko was in Helsingfors organizing the sailors' departures for Petrograd. In the book Radio October...On the "Krechet" in Helsingfors, radio operator Makarov hands a telegram to Pavel Dybenko with the report of the "Samson" commissar, Grigoriy Borisov: "To Tsentrobalt. Everything is calm in Petrograd. The power is in the hands of the revolutionary committee. You have to immediately get in touch with the front committee of the Northern Army in order to preserve unity of forces and stability." The following day, 8 November [O.S. 26 October] 1917, the Congress elected a Council of People's Commissars (Sovnarkom) with Lenin as leader as the basis of a new Soviet Government, pending the convocation of a Constituent Assembly, and passed the Decree on Peace and the Decree on Land. This new government was also officially called "provisional" until the Assembly was dissolved. The Council of People's Commissars now began to arrest the leaders of opposition parties. Dozens of Constitutional Democratic Party (Kadet) leaders and members of the Constituent Assembly were imprisoned in The Peter and Paul Fortress. These were to be followed by the arrests of Socialist Revolutionary Party and Menshevik leaders.. 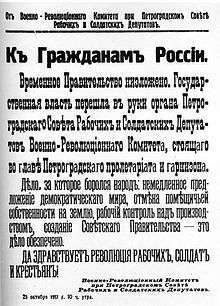 Posters were pinned on walls and fences by the SRs describing the takeover as a "crime against the motherland and revolution". There was also strong anti-Bolshevik opposition within Petrograd. On 9 November [O.S. 27 October] 1917, the Mensheviks seize power of Georgia and declare it an independent republic. The Don Cossacks also claim control of their own government. There is strong anti-Bolshevik opposition outside of Petrograd, with Bolshevik control of country still very weak. There are also reports that the Provisional Government has not conceded defeat and are meeting with the army at the Front. On 10 November [O.S. 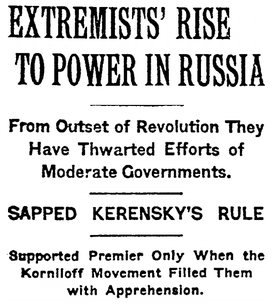 28 October] 1917, posters and newspapers start criticizing the actions of the Bolsheviks and refute their authority. The Executive Committee of Peasants Soviets "refutes with indignation all participation of the organised peasantry in this criminal violation of the will of the working class". Strong opposition to the Bolsheviks still continues from several important proletariat sources. On 11 November [O.S. 29 October] 1917, opposition to the Bolsheviks develops into major counter-revolutionary action. Cossacks enter Tsarskoye Selo on outskirts of Petrograd with Kerensky riding on a white horse welcomed by church bells. Kerensky gave an ultimatum to the rifle garrison to lay down weapons, which was promptly refused. They were then fired upon by Kerensky’s Cossacks, which resulted in 8 deaths. This turned soldiers in Petrograd against Kerensky because he was just like the Tsarist regime. Kerensky’s failure to assume authority over troops described by John Reed as a ‘fatal blunder’ that signalled the final death of the government. On 12 November [O.S. 30 October] 1917, the battle against the anti-Bolsheviks continues. The Red Guard fights against Cossacks at Tsarskoye Selo, with the Cossacks breaking rank and fleeing, leaving their artillery behind. On 13 November [O.S. 31 October] 1917, the Bolsheviks gain control of Moscow after a week of bitter street-fighting. Artillery had been freely used with an estimated 700 casualties. However, there is still continued support for Kerensky in the provinces. On 14 November [O.S. 1 November] 1917, there is an appeal to anti-Bolsheviks throughout Russia to join new government of the people, with the Bolsheviks gradually winning the support of the Russian people. On 15 November [O.S. 2 November] 1917, there is only minor public anti-Bolshevik sentiment; for example, the newspaper Novaya Zhizn criticises the lack of manpower and organisation of the Bolsheviks to run a party, let alone a government. Lenin confidently claims that there is "not a shadow of hesitation in the masses of Petrograd, Moscow and the rest of Russia" towards Bolshevik rule. On 20 December 1917 the Cheka was created by the decree of Vladimir Lenin. These were the beginnings of the Bolsheviks' consolidation of power over their political opponents. The Red Terror was started in September 1918. The Jacobin Terror was an example for the Soviet Bolsheviks. Leon Trotsky had compared Lenin to Maximilien Robespierre as early as 1904. The Church's properties (including bank accounts) were seized. Bolshevik-led attempts to seize power in other parts of the Russian Empire were largely successful in Russia proper — although the fighting in Moscow lasted for two weeks — but they were less successful in ethnically non-Russian parts of the Empire, which had been clamoring for independence since the February Revolution. For example, the Ukrainian Rada, which had declared autonomy on 23 June 1917, created the Ukrainian People's Republic on 20 November, which was supported by the Ukrainian Congress of Soviets. This led to an armed conflict with the Bolshevik government in Petrograd and, eventually, a Ukrainian declaration of independence from Russia on 25 January 1918. In Estonia, two rival governments emerged: the Estonian Provincial Assembly proclaimed itself the supreme legal authority of Estonia on 28 November 1917 and issued the Declaration of Independence on 24 February 1918, while an Estonian Bolshevik sympathizer, Jaan Anvelt, was recognized by Lenin's government as Estonia's leader on 8 December, although forces loyal to Anvelt controlled only the capital and a few other towns. In an attempt to intervene in the civil war after the Bolsheviks' separate peace with the Central Powers, the Allied powers (United Kingdom, France, United States and Japan) occupied parts of the Soviet Union for over two years before finally withdrawing . The United States did not recognize the new Russian government until 1933. 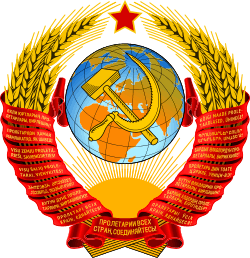 The European powers recognized the Soviet Union in the early 1920s and began to engage in business with it after the New Economic Policy (NEP) was implemented. Soviet historians of the October Revolution interpreted the Revolution so as to establish the legitimacy of Marxist ideology, and also the Bolshevik regime. To establish the accuracy of Marxist ideology, Soviet historians generally described the Revolution as the product of class struggle. They maintained that the Revolution was the supreme event in a world history governed by historical laws. The Bolshevik Party is placed at the center of the Revolution, exposing the errors of both the moderate Provisional Government and the spurious "socialist" Mensheviks in the Petrograd Soviet. Guided by Vladimir Lenin's leadership and his firm grasp of scientific Marxist theory, the Party led the "logically predetermined" events of the October Revolution from beginning to end. The events were, according to these historians, logically predetermined because of the socio-economic development of Russia, where the monopoly industrial capitalism alienated the masses. In this view, the Bolshevik party took the leading role in organizing these alienated industrial workers, and thereby established the construction of the first socialist state. During the Cold War, Western historiography of the October Revolution developed in direct response to the assertions of the Soviet view. The Soviet version of the October Revolution conditioned historical interpretations in the United States and the West. As a result, these Western historians exposed what they considered flaws in the Soviet view, thereby undermining the Bolsheviks' original legitimacy, as well as the precepts of Marxism. These Western historians presented the revolution as the result of a chain of contingent accidents. Examples of these accidental and contingent factors that precipitated the Revolution include World War I's timing, chance, and the poor leadership of Tsar Nicholas II as well as liberal and moderate socialists. According to this historical interpretation, it was not popular support, but rather Bolshevik manipulation of the masses and the organization’s ruthlessness and superior structure which enabled it to survive. For these historians, the Bolsheviks’ defeat in the Constituent Assembly elections of November–December 1917 demonstrated popular opposition to the Bolsheviks’ coup, as did the scale and breadth of the Civil War. These historians saw the organization of the Bolshevik party as proto-totalitarian. Their interpretation of the October Revolution as a violent coup organized by a proto-totalitarian party reinforced the idea that totalitarianism is an inherent part of Soviet history. For them, Stalinist totalitarianism developed as a natural progression from Leninism and the Bolshevik party’s tactics and organization. The dissolution of the USSR affected historical interpretations of the October Revolution. Since 1991, increasing access to large amounts of Soviet archival materials made it possible to re‑examine the October Revolution. Though both Western and Russian historians now have access to many of these archives, the effect of the dissolution of the USSR can be seen most clearly in the work of historians in the former USSR. While the disintegration essentially helped solidify the Western and Revisionist views, post-USSR Russian historians largely repudiated the former Soviet historical interpretation of the Revolution. As Stephen Kotkin argues, 1991 prompted "a return to political history and the apparent resurrection of totalitarianism, the interpretive view that, in different ways…revisionists sought to bury". There has additionally been the revival among some historians of the "continuity thesis", the idea that there was an uncomplicated, natural evolution from the October Revolution’s organizational structure to Stalin’s Gulags. 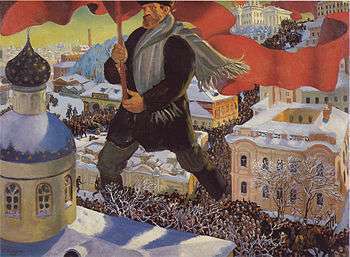 7 November, the anniversary of the October Revolution, was the official national day of the Soviet Union from 1918 onward and still is a public holiday in Belarus, Kyrgyzstan, and the breakaway territory of Transnistria. ↑ Bunyan & Fisher 1934, p. 385. ↑ Richard Pipes (1990). The Russian Revolution. Knopf Doubleday. p. 407. ↑ Michael C. Hickey (2010). Competing Voices from the Russian Revolution: Fighting Words: Fighting Words. ABC-CLIO. p. 559. ↑ Beckett, 2007. p. 526. ↑ Service, 2005. p. 54. 1 2 Beckett, p. 528. ↑ Jonathan Schell, 2003. 'The Mass Minority in Action: France and Russia'. In The Unconquerable World. London: Penguin, pp. 167–185. ↑ "ВОЕННАЯ ЛИТЕРАТУРА --[ Мемуары ]-- Дыбенко П.Е. Из недр царского флота к Великому Октябрю". ↑ "ВОЕННАЯ ЛИТЕРАТУРА --[ Биографии ]-- Савченко В. А. Авантюристы гражданской войны". 1 2 3 Acton, Critical Companion, 7. ↑ Stephen E. Hanson (1997). Time and Revolution: Marxism and the Design of Soviet Institutions. U of North Carolina Press. p. 130. ↑ Kevin Murphy, "Can we write the history of the Russian Revolution?," http://www.isreview.org/issues/57/feat-russianrev.shtml (May 2011). Radek, Karl (1995) [First published 1922 as "Wege der Russischen Revolution"]. "The Paths of the Russian Revolution". In Bukharin, Nikolai; Richardson, Al. In Defence of the Russian Revolution: A Selection of Bolshevik Writings, 1917–1923. London: Porcupine Press. pp. 35–75. ISBN 1899438017. OCLC 33294798.